I am back with my third design for March's NCC theme. 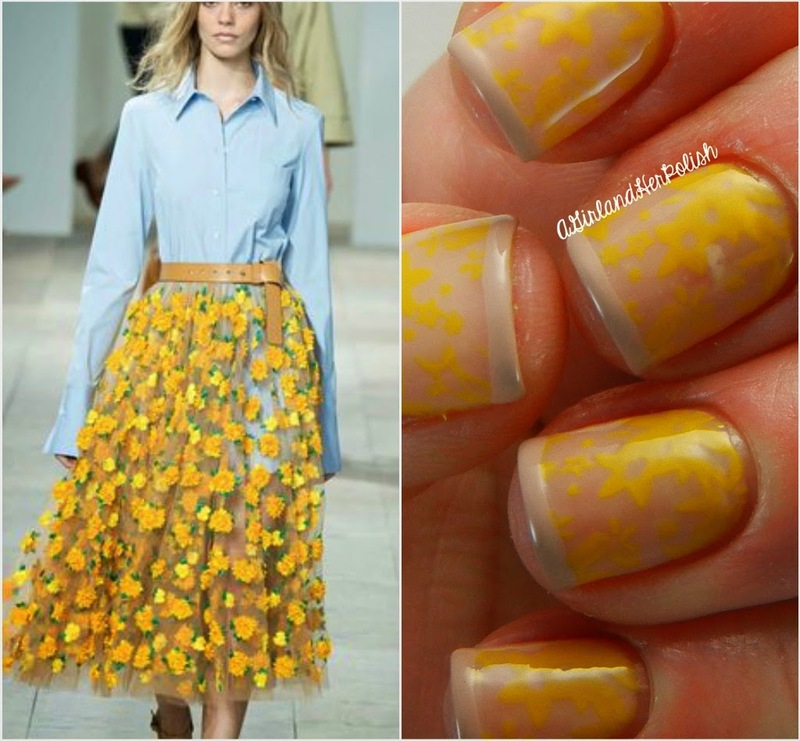 I can never pass up a yellow design, be it on my nails or clothes. When I came across the yellow floral skirt from Michael Kors' Spring Collection I knew I had to recreate it. Plus it is a great negative space manicure! I started with two coats of Samoan Sands. Two coats of this gorgeous black label hides a good bit of the flaws on my nails but still gives a nice base for a negative space manicure. I used Chick Me Out and MoYou London Pro 06 to add my yellow flowers. This looks pretty awesome! I added a thin French using Do You Take Lei Away? to represent the belt. This thin line really ties the whole design together. I love how this design turned out! I am going to have to do this again with some other colors and images! absolutely brilliant! Amazing execution, love it! That skirt you drew inspiration from is cute! I am a huge Michael Kors fan and you're recreation is fantastic! What a great idea, nice job! These are stunning! I love how you've interpreted this theme!